In October 1214, King John returned to England in disgrace. His mission to reconquer his lost territory in northern France had failed, and his allies had been dealt a devastating defeat by the French in the Battle of Bouvines. Ten years of preparing and raising funds for his campaigns against France had come to nothing. The empire his father had put together was rapidly falling to pieces. John returned to an England on the brink of civil war. A group of unhappy barons from across the country had formed an association, and were prepared renounce him. 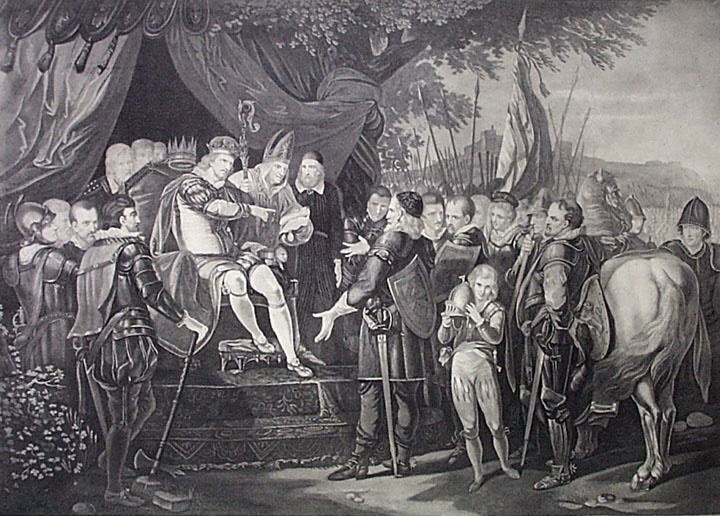 Over the next eight months, they made repeated demands to the King, requesting that he give them a guarantee that he would observe their rights. But these negotiations came to nothing. And so it was that, on 5 May that year, the barons gathered and agreed to declare war on King John. Their leader—Robert FitzWalter—styled himself ‘marshal of the army of God and the holy church of England’. On 17 May 1215 the barons captured London—the largest town in England—without a fight. With London lost and ever more supporters flocking to the side of the barons, John must have realised that he was in a dangerous position. On 8 June, John issued letters of safe conduct to the barons, requesting that they arrive at Staines to discuss terms of peace. In the next few days, the barons assembled in great numbers at Runnymede, a relatively obscure meadow that lies between the town of Staines and Windsor castle, where King John was based. They arrived to repeat their demands and negotiate peace terms. …the barons assembled between Windsor and the Staines, in a meadow which is called Runnymede, with a multitude of eminent knights, and well-armed from all points; and in this place, having fixed their tents, they remained. And the King, with his men, remained apart from the rest in the same place, in his pavilions. Unfortunately, not much else is known about how the negotiations took place at Runnymede. They most likely continued for a number of days, at least between 10 June and 15 June. The leaders on the baronial side probably included Robert FitzWalter, Richard de Clare, Geoffrey de Mandeville, Roger Bigod, and Saer de Quincy. King John’s advisors included the Archbishop of Canterbury, Stephen Langton, and a number of other loyal clerics and barons. The King himself did not spend the whole time at Runnymede; he spent the nights at the nearby castle of Windsor. At some point early on in the negotiations, King John had his seal affixed to a document known as the ‘Articles of the Barons’. The Articles are believed to be an early draft of a peace agreement, and can be read in English here. Over the following days, the King and the barons negotiated and refined the terms, until they were finalised as the Magna Carta. Traditionally, the date of the initial sealing of Magna Carta has been 15 June 1215. This is the date that appears on the original documents themselves. You can read a full English translation of Magna Carta here.